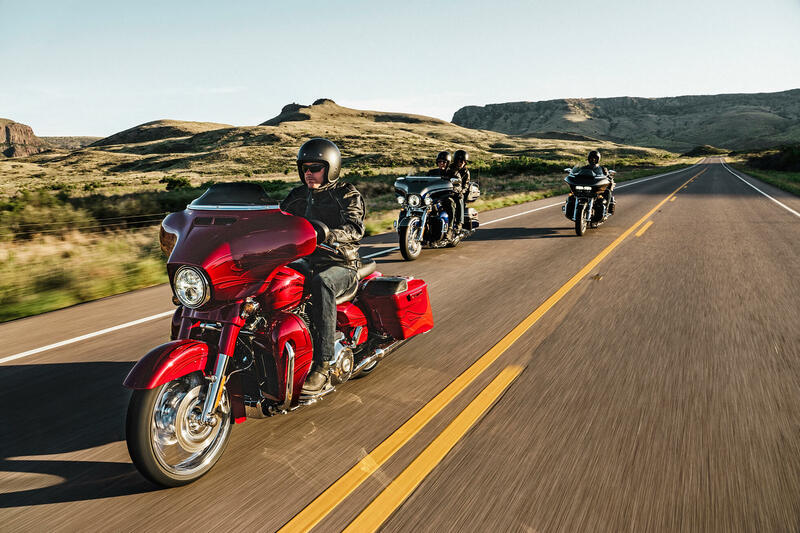 The CVO™ or Custom Vehicle Operations lineup is the most incredible line up of motorcycles on the road today. The CVO™ Road Glide Ultra is no exception – it’s a fully loaded bagger that’s packed with custom styling details. Road ready for the Rockies and anywhere else from Denver, Colorado to all over the country. Find out more about the CVO™ Road Glide Ultra® here at Avalanche Harley-Davidson®. 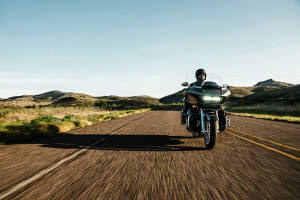 You get everything you need to handle any ride and any situation with the CVO™ Road Glide® Ultra. 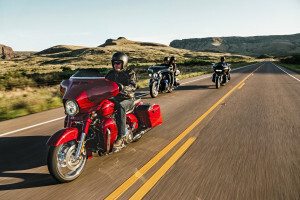 Six-Speed Cruise Drive Transmission: You’ve got plenty of power with the big V-Twin between these two wheels, but you’ll be controlling it with the transmission. It’s a smooth shifting gearbox that lets you easily stay within the engine’s power band. 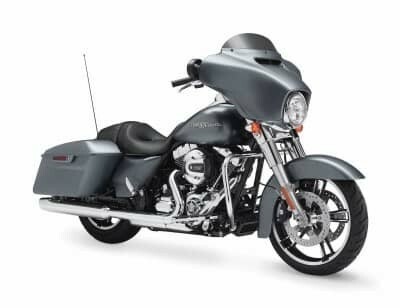 Airflow Collection: The CVO™ Road Glide® Ultra receives a full complement of Airflow Collection accessories: rider footboard inserts, passenger footboard inserts, shifter pegs, brake pedal and cover, highway pegs, heated handgrips with rubber inserts, and shift lever arms. Dunlop Multi-Tread Tires: These tires are truly innovative. On the inside they offer a hard compound to provide durability and flat protection, but on the sides they offer a softer, stickier compound for cornering traction. Mirror Chrome Slicer Wheels: Others will have to keep themselves from staring at these beautifully polished, mirror finished, 20-inch chrome slicer wheels. The 90 degree valve stem makes the tires even easier to top off. Twin-Cooled Twin Cam 110™ Engine: With more displacement and more power, you’ve got more low-end torque, more passing power, faster roll-on, and a gorgeous exhaust note. It even manages to direct less heat to the rider on hot days that other engines. What more could you want? LED Turn Signals: These classic, sleek chrome bullet turn signals conceal completely modern, ultra bright LED turn signals. Brembo® Brakes: The Brembo® name means stopping power. With dual discs and 4-piston front and rear brakes, along with a dual front rotor brake system, you’ve got all the power you need to rein things in quickly from any speed. Ergonomically Designed Hand Controls: To log big miles you need to be comfortable. 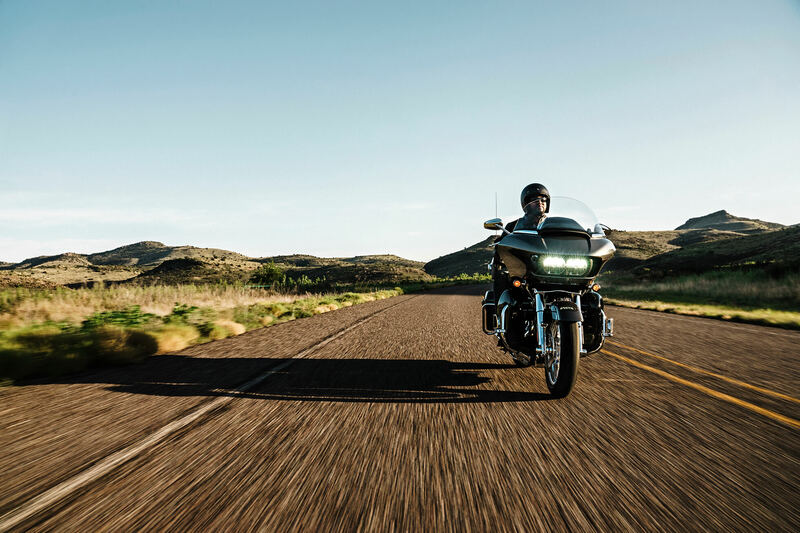 That’s why the hand controls on the CVO™ Road Glide® Ultra are designed around your body to make sure you can tackle any day in the saddle with ease. Twin Cam 110 Engine Heritage: Carrying on the legacy of the Flathead, Knucklehead, Panhead, Shovelhead, Evolution®, Twin Cam 88®, and Twin Cam 96™, the Twin Cam 110™ delivers the performance and reliability you know and love. Reflex™ Linked Brakes: Brakes work better when they’re linked together, and with standard antilock brakes, you can forget about locking up a wheel. This is what stopping confidence looks like. Twin Cooled™ Twin Cam 110™ Engine Innovation: Thanks to the lightweight piston design, a strong driveline, and strong internal parts, you get added reliability and more performance than ever before. Single Integrated Security and Locking Fob: This factory installed system makes it possible to jump on the bike, start it up, and go all without using your key. The keyring allows you to wireless enable and disable the security system with ease. 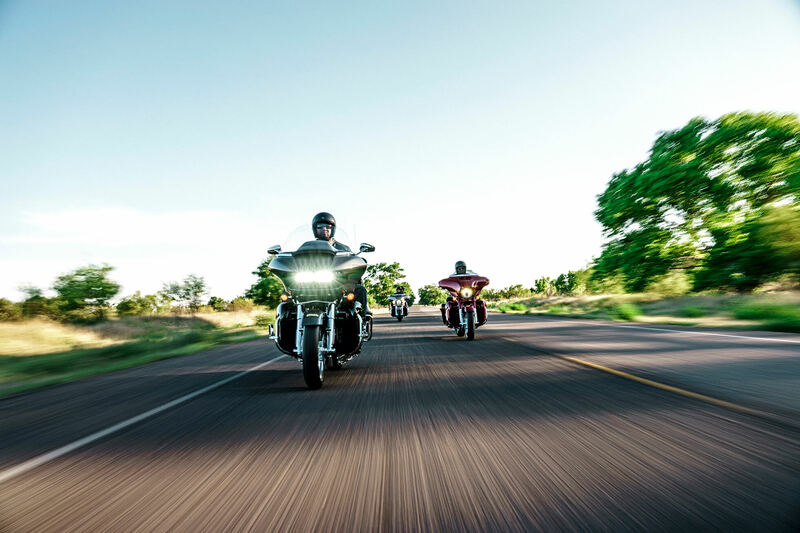 You expect the latest in infotainment and connectivity features from a bike of this caliber, and you get it with the latest H-D® infotainment features. Tire Pressure Monitoring: All you have to do is pull up your tire pressure monitoring system on your infotainment screen. No need to grab for a tire pressure gauge in your bag. Premium GPS Features: You’ve got premium navigation with GPS built right into the infotainment system. It even includes 3D maps and three map updates over the next three years. 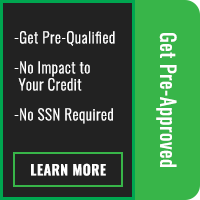 SiriusXM Satellite Radio: The CVO™ Road Glide® Ultra comes standard with satellite radio, allowing you to tap into the latest music, talk, news, sports, and more. Chrome Tank Console with CB Pod: This premium touch gives you a diamond cut chrome tank console with a charcoal CB pod insert, all within the classic fuel tank of the CVO™ Road Glide Ultra. Jukebox USB Port: It’s a breeze to plug in your USB compatible devices to recharge and to listen to your own music via the bike’s integrated speakers. Boom!™ Box 6.5GT Radio: This smart infotainment and audio system delivers crystal clear sound with 75 watts per channel and only 1 percent distortion. It also includes a factory tuned optimized equalizer that automatically adjusts for speed. 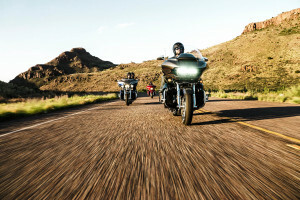 Nothing feels quite like hitting the open road on a super premium Harley-Davidson® touring bike. Fairing Lowers: When you log long miles a minor irritation can turn into a major problem, and that’s why you get these specially designed fairing lowers. They keep the wind, rain, and road grime off your legs. Sharknose Fairing Design: No fairing in the history of motorcycling has ever cut through the wind like this one does. 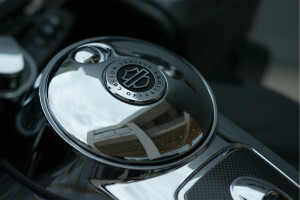 It’s got triple split-stream vents that open and close to equalize pressure in front and behind the windscreen. It cuts down on head buffeting better than any bike on the road. Adjustable Air Suspension: Suspension is a balance of giving you the feedback you need for confident handling, while also cutting out the harsh bumps that you don’t want. The Adjustable Air Ride suspension is easily changed so you can dial in to suit your riding preferences. Heated Hand Grips: It can get cold when you’re logging miles year round in all conditions. Heated hand grips let you extend your riding season. Standard Cruise Control: Set the cruise and start eating up those miles. It’s a whole lot better than dealing with the throttle yourself on those long, empty stretches of highway. Ergonomically Designed Hand Controls: Stay focused on the ride with hand controls that include infotainment features, turn signals, cruise control, and more. Passenger Seat Space and Leg Room: Did you ever hear your passenger complain about having too much space? Probably not. 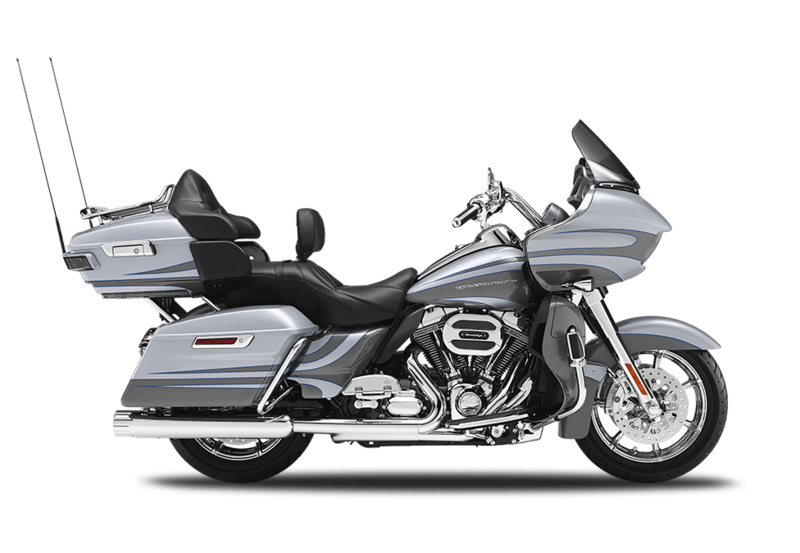 The CVO™ Road Glide® Ultra delivers more passenger space to provide more comfort for those riding in back. Custom Suspended Dual Control Heated Seat: The seating on this bike delivers increased comfort and style thanks to hand stitched leather. It’s even suspended, so it’ll soak up the roughest roads with ease. 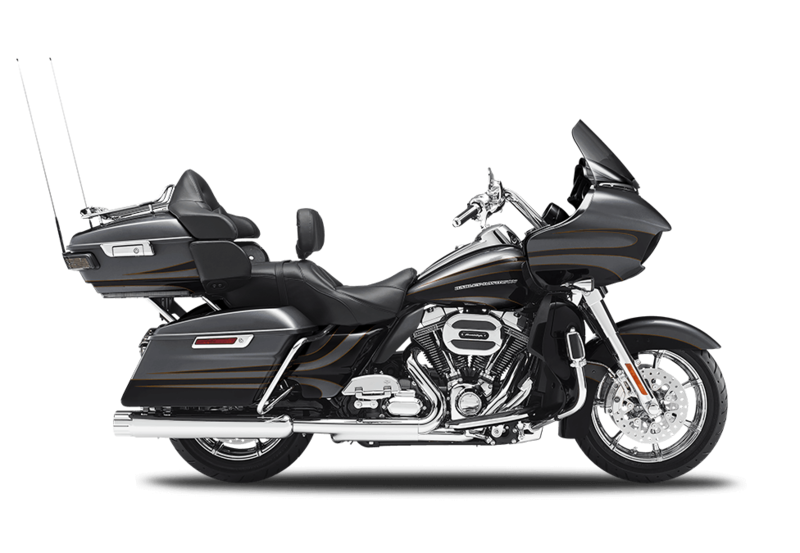 We think you’ll agree that the CVO™ Road Glide® Ultra is one of the most dynamic, eye-catching rides out there. 13.5-inch Custom Windscreen: This unique custom windscreen keeps the wind and insects off your face. It also gets a stylish bit of chrome trim. Chrome Dual Exhaust: It’s hard to ignore the unique 4-inch touring mufflers, chrome end caps, and chrome exhaust shields out back, not to mention the rumbling exhaust note that emits from them. 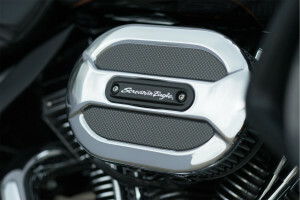 Pure Harley-Davidson® Styling: The Twin-Cooled™ Twin Cam 110™ engine with Screamin’ Eagle® V-Twin is a sight to behold. Gleaming air cleaner cover and rocker covers, granite heads and cylinders, and machined cooling fin tips all help it stand out from the crowd. 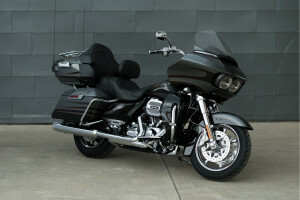 Tour-Pak® Luggage Carrier Design: Like the saddlebags, the Tour-Pak® luggage carrier design sports a sleek look, but they can also swallow plenty of luggage, including up to two full face helmets. 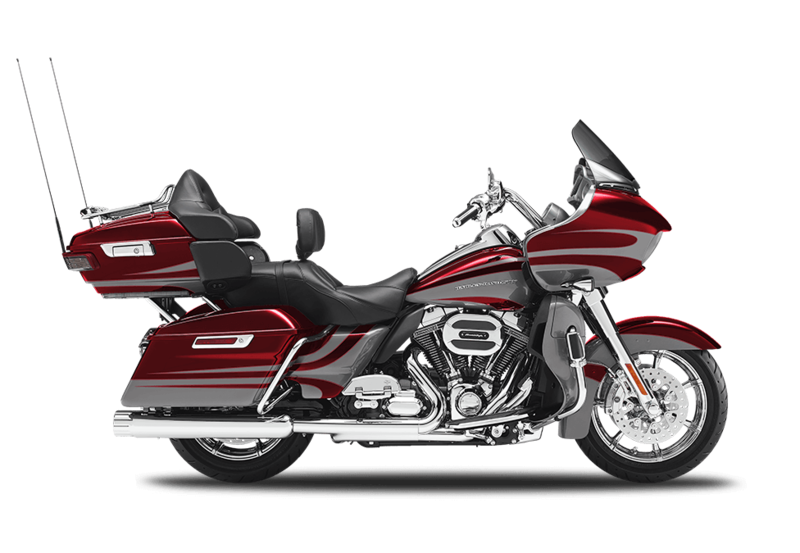 High Impact Graphics: Each CVO™ model gets brilliant graphics and hand finished paint, and the CVO™ Road Glide® Ultra is no exception. It receives stylish, high impact, stylized flames. Color Matched Inner Fairing: While many bikes get a gloss black inner fairing, this one includes color matching. 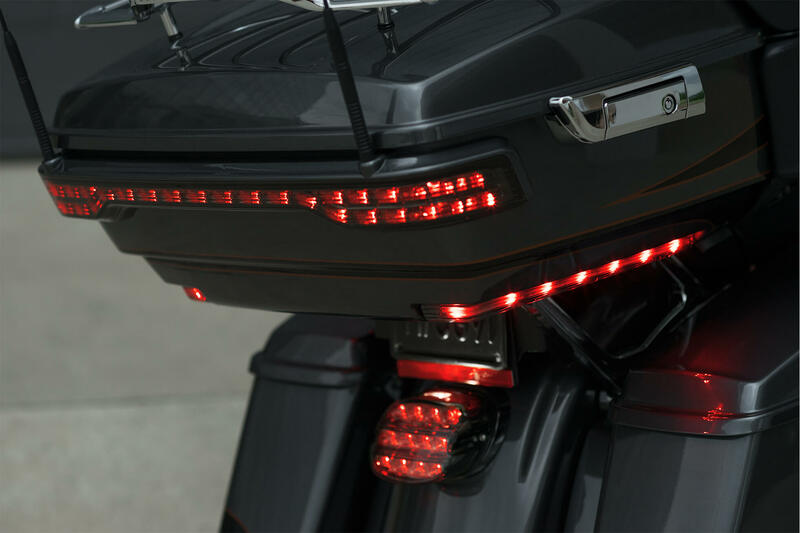 It’s a custom feature that makes the CVO™ Road Glide® Ultra stand out even more. Restyled Fairing, Saddlebags, Tour-Pak® Luggage Carrier and Front Fender: This ride is ready to take off for a few weeks or a few months on the road. That’s why we’ve included many redesigned features to make it easy to take it out for the long haul. Ventilator Intake: The big, bold air intake on the side of the engine bears the distinctive Screamin’ Eagle® badge, and it doesn’t just look good. It also feeds the engine the air it needs to work efficiently and at maximum power. Color Matched Vent and Lighting Trim: While many lower tier bikes will use black or brightly finished trim pieces, the CVO™ Road Glide® Ultra gets full color matched trim for that completely custom look. Hand Laid Graphics and Tank Badge: Every CVO™ Road Glide® Ultra is a work of art thanks to hand laid graphics and the distinctive tank badging. It’s an appropriate finish for such an exclusive ride. LED Bullet Turn Signals: These sleek, chromed bullet turn signals encase a high tech, super bright LED lighting system. It ensures that everybody on the road can see which direction you’re signalling.